No one would ever accuse Star Clipper of being a "floating hotel." Instead, it's a sleek clipper ship, carrying only 170 passengers and powered by prevailing winds -- with a backup motor and generator to provide creature comforts. Everything about Star Clipper is nautical, from the astonishing web of lines that work the 16 billowing sails to the framed prints adorning its cabins, and from the varnished mahogany woodwork and brass-fitted portholes to the striped jerseys the crew sports. That's all because Star Clipper -- which holds a Guinness World Record as the tallest of tall ships -- was built to fulfill company owner Mikael Krafft's vision of recreating the golden age of clipper ships. His ships aim to offer the romance of the sea, coupled with a cushier trip than our seafaring ancestors enjoyed. 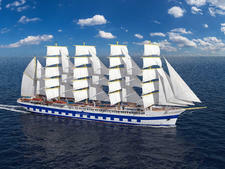 Where does Star Clippers fit amid the small number of cruise lines flaunting canvas? It has more amenities than a windjammer-type experience, where you might be expected to heave-ho on the ropes, but less luxury than the near-legendary Sea Cloud ships. It's a more authentic tall ship experience than Windstar's cruise ships with computer-manned sails but, in exchange, Star Clipper's cabins are smaller and the food more limited. The ship splits its time between cruising out of Phuket, Thailand (October to May), and Bali or Singapore (May to October), with voyages typically lasting seven days, but a few stretching to two weeks. The focus is on sun and fun, with many stops at uninhabited islands, where the sports staff deploys a collection of water toys. Star Clipper also hosts a PADI dive instructor and a full complement of diving and snorkeling equipment. Itineraries usually also include a few shore excursions, as well as a port or two with more enticements, ranging from cultural melting-pot Penang to Komodo National Park, home to the eponymous dragons. You need to be a particular type of passenger to appreciate this ship and, chances are, you will either love the experience or be a bit disappointed that you were less coddled and had to "rough it" more than you expected. Star Clipper demands agility. There are stairs to climb up and down, ropes to sidestep and most calls involve climbs down a stairway into a bobbing tender. Many landings are "wet," meaning you'll have to descend a ladder on the tender's bow into a couple of feet of water. Star Clipper doesn't have stabilizers, and can heel-over under sail, as well, giving your cabin floor a slight funhouse tilt. There are no elevators, either. If all that sounds exciting and adventurous rather than intimidating, Star Clipper is for you. You'll likely enjoy clambering up to the crow's nest (secured in a safety harness), donning an eye patch for Pirate Night and grabbing the mic during the talent show. Truth be told, it's a bit like seafaring summer camp for adults. This is the sort of cruise where you unwind and start seeing the world at a slower pace -- where sunsets are more magnificent and the stars brighter than you've ever noticed before. 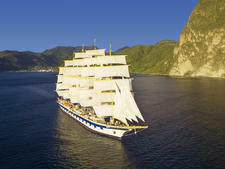 Star Clipper attracts a mix of age ranges from low 30s through retirees. What links the passengers is not a particular age but rather a sense of adventure and, especially for the honeymooners onboard, the romance of being on a tall ship under sail power. And, although you'll find plenty of gray hair among the passengers, most are nimble enough to navigate boarding tenders and hopping off into the water at a wet landing. It means that there is less disparity during activities and everyone walks at a similar pace during shore excursions. On our cruise, 10 countries were represented among the 87 passengers, making Star Clipper a mini-United Nations. There was a large contingent of Germans, as well as many other Europeans, along with a few Aussies, plus a smattering of other nationalities. Americans are often in the minority, but English is the ship's lingua franca. However, announcements and instructions are made in German and French, as well. That can make things tedious during safety drills or briefings. On the brighter side, if you enjoy rubbing shoulders with folks from around the world (and maybe even practicing your high school French), the polyglot passenger list more than makes up for that slight annoyance. The international crowd can mean there are more smokers than you might typically find on an American-dominated ship, and you'll likely catch a whiff of smoke when passing through the designated smoking areas at the outdoor bar or upper deck. There's no smoking allowed in any indoor locations, though. Dress code is very casual, though some passengers -- admittedly mostly women -- tend more toward "casual elegance" in the evenings. It's requested that men wear long trousers in the dining room, but we noticed plenty of guys in shorts, particularly later in the cruise. "No flip-flops or sandals" in the dining room is another request that isn't strictly enforced. Some passengers choose to dress a bit more formally for the captain's dinner night, but for a few men that simply meant donning a sport jacket over an open-collared shirt. One evening is designated "pirate night," when the serving and entertainment crew sport dastardly moustaches, eye patches and fake cutlasses. A few passengers tend to join in by tying sashes around their waists or heads, but no one on our cruise went "full parrot." Because you'll be in the tropics, be sure to bring a good sun hat and umbrella (which can double as a parasol). You may also want to consider a long-sleeved swim shirt to protect your back when snorkeling, as well as water shoes for wet landings. Depending on your port calls and excursions, you may need to consider bringing a few conservative clothing items if you're visiting religious sites. And If you're passing through a more cosmopolitan port (Singapore, for example) with fine-dining options, you might want to step up the style-factor. 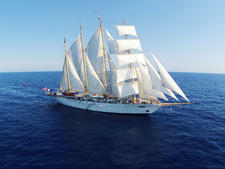 Star Clipper isn't an "all-inclusive" ship, by any means. You even have to buy your own bubbly at the "Champagne Sail Away Party." That being said, prices for drinks, shore excursions and other extras are reasonable. You will receive a welcome plate of cookies and fruit, as well as one complimentary bottle of water in your cabin per cruise. Gratuities aren't included either, and the line recommends tips of €5 per person, per day, for the wait staff and €3 per person, per day, for cabin stewards. These can be added onto your bill or you can drop them off in cash at the purser's office. Because gratuities are meant to be pooled among the cabin stewards and dining room staff, individual tipping is discouraged. Tipping of shore excursion guides and drivers is at passengers' discretion, but always appreciated.